Montemerano I love. A Tuscan hilltown in the heart of the Maremma. The road from the gate spirals up – a gorgeous walk – through the archways and to the alleys. These towns are multi-levelled structures so be warned that walk is up and down. On the way you pass through more architectural wizardry, and renaissance design: upper stories, recessed into the corners of buildings, with railings round the balconies and flower boxes, and the inevitable washing on lines, and wall plants, and pots; and intricate stone. Another garden village I wish I lived in. One does get wistful in South Tuscany. I wonder, when my boy’s grown, and I’m too old to travel, where will the wife and I grow old? How to decide, from all the places we’ve been, where to settle? I’d settle with people who are young at heart, on a farm by a Tuscan hilltown. Maria needs shops, marketplaces, piazze and conversation... lots of conversation. Like anywhere in Italy all of that is available here in Southern Tuscany. … where I’d walk most often though the Piazza dei Castello. So quiet. The atmosphere in the center is fairylike, and hardly busy. How Anna comes to her flavors and textures I don’t know. Gnocchi is taken to new levels, effortlessly. It’s in the wrist, they say. She thinks we should settle here, Maria agrees. In Tuscany, one can argue with the women, but not with their risottos. Anna is a chef at Agriturismo Poggio Cucco , where slow food comes at regular intervals, alongside peace and quiet, a bathroom, Wi Fi, and comfy beds. Ideal at siesta time. Residenza Pratini is an unpretentious hotel. Plain, but as you stay it grows on you. The rooms are elegant, open, spacious enough, and the amenities are adequate. Apart from Anna’s risotto, try the hand-made gnudi at Caco e vino, with one of their house wines; and the 'Pappardelle Cinghiale' at La Cascia: a boar ragout that that sticks to bones. Yum. The Chiesa San Giorio sports the Madonna of the Cats: famous art in an artful town, attributed to the anonymous Master of Mermerano. Mermerano is a garden, a museum and a gallery, where history is seen before it is read about. Must sees are the sculptures of Vecchietta and the altar by Sano di Pietro… and the fresco in Chiesa di Giovanni Battista. This is again Etruscan ground: an historical wonderland. I’m inspired to ride my bike from town to town. I did once. It was tough going for a codger like me, but is perfect for the sporty romantic and I still love cycling around here although my horizons are not quite so distant now and the stops for lunch have become longer than the actual cycling part. Perhaps Maria is right, and we should settle here. In Montemerano, one must always move on too soon… but time is spent slowly, nonetheless. Nothing like a lazy day in the sun surrounded by friends in Italy. Memories made here tend to be of the lifetime sort. I share my idyllic experiences. There are times I travel when the rooms are too small and the taps don’t work… but the Kodak moments DO happen, often. Such is life in Southern Tuscany. It is best to have your own car: AutoEurope has a good choice of car models and some excellent advice about driving in Italy on their site. The closest train station is Albinia. 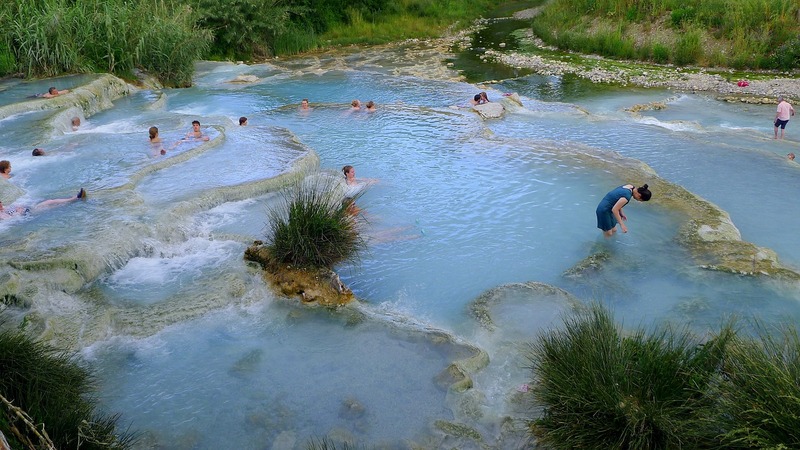 From there buses come to Montemerano, as well as to Saturnia, home of The Maremma’s famous hot springs.